The business, finance and banking industry is extremely varied with so much to offer to students. Whether you’re looking to discover your future career path, gain a deeper insight into top employers such as Deloitte, SA Global and Legal & General, or you are just looking to see what opportunities are on offer, we have you covered. We understand that the industry has many different potential routes, so we have you covered from Accounting right down to Marketing and Retail. Have a mathematical mind? Thinking about being an accountant? Be sure to head down to visit Deloitte with their audit and finance schemes. Want to take on the challenge of working for one of the big four? Get down to see PwC with their widely recognised structured programmes that allow you to get a taste from all of their industries in a management role. PwC will also be holding a talk on the day about work experience opportunities from 13:15-14:00. Book your space for this talk by visiting Your Careers Account. Traditional paths not for you? Head down to visit Teach First with their extremely rewarding leadership development programme, which gives you an exclusive insight into the education system. Research employers and go in prepared. Find out which employers you would like to visit and do some background research so you can then prepare key questions you’d like to ask. Ask as many questions as possible. These employers are here to see YOU and are expertise in your area of interest so make the most of your chance and come out with as much information as you can. Get involved and enjoy. The day is a massive opportunity for you to get stuck in and meet over 25 top employers but there are also opportunities to take part in other activities and collect a few freebies along the way. Don’t miss out! 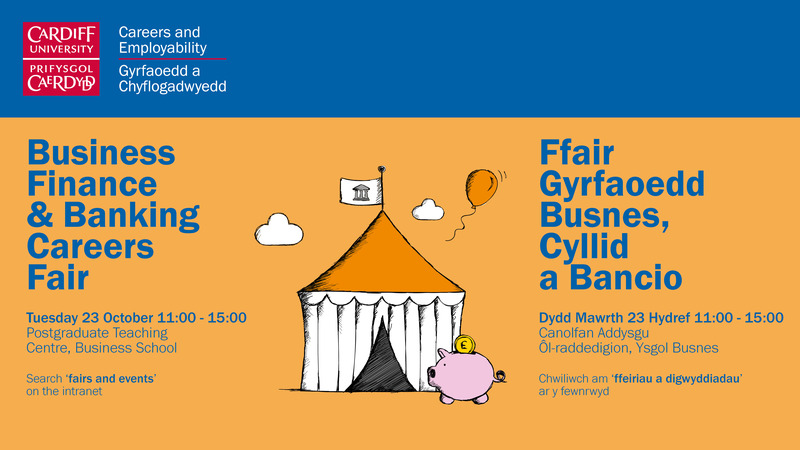 Take your future into your hands and come to the Business, Finance and Banking Fair on Tuesday 23rd October, between 11:00 and 15:00 in the Postgraduate Teaching Centre. Look forward to seeing you there and igniting your futures.